Everybody look to your left. Now look to your right. One of you is probably a Cylon. It might even be you. 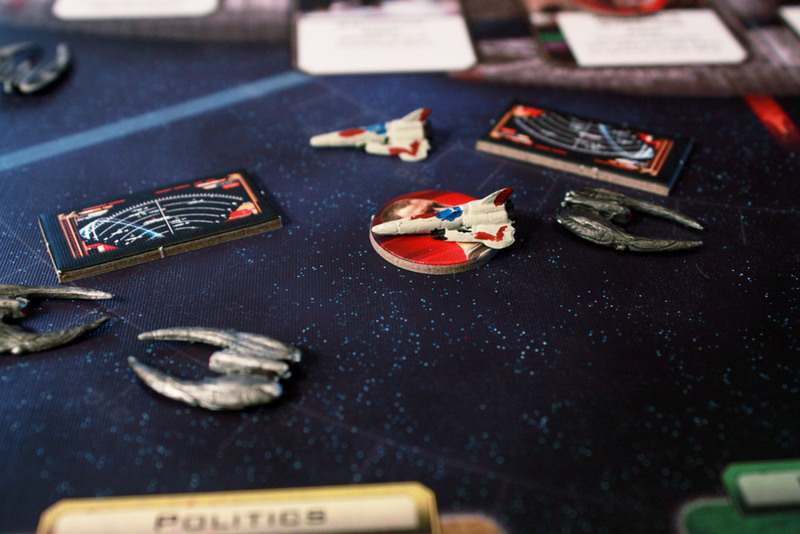 At least, that’s the way of things in Fantasy Flight’s Battlestar Galactica: The Board Game. Players will take on the roles of characters from the (modern) show as they face dangers, tense political situations, dwindling supplies, and of course the fact that some of the players are secretly Cylons working against them. Fantasy Flight Games is known for their complex, immersive, and highly thematic games with thick rulebooks, BSG is no exception; however, the rules are actually pretty straightforward and once you get going there isn’t a whole lot to remember as long as you have at least 1 experienced player. Players are tasked with protecting Galactica as her crew prepares for one light speed jump after another, with the goal of traveling enough distance to reach Kobol, which holds the key to finding Earth. Each turn, a player will draw a few skill cards, move their character anywhere on the ship, perform an action (either from the location they moved to, or from a Skill card or character ability), and finally draw and resolve a Crisis Card. Actions range from ship repairs, to piloting Vipers (the small fighters), to holding political elections, to throwing someone in the brig. Each turn, players must deal with a Crisis card which puts forth a challenge that must be dealt with immediately. In some cases these cards send forth a fleet of Cylon ships, but in most cases the conflict is internal. Often these “crises” are resolved by a particular player choosing between two bad outcomes, but most commonly there are “skill checks” required. Skill checks are where Cylon infiltration comes in. During a skill check, each player passes skill cards secretly into the challenge. Much like the Resistance although less binary, some skill cards help the challenge and some hurt it. The result of the crisis depends entirely on the total skills added in, with certain cards subtracting from the total instead of adding. In addition, random skill cards are added from a “destiny deck,” which could throw a wrench into any plan, or hide the evil machinations of a Cylon player. Players must survive crisis after crisis, fight off enemies, repair damage, and defend civilian ships as Galactica prepares for “jump,” BSG’s flavor of faster-than-light space travel. Each time Galactica jumps, it gets closer to Kobol, which holds the key to finding Earth. Not that it’s easy. 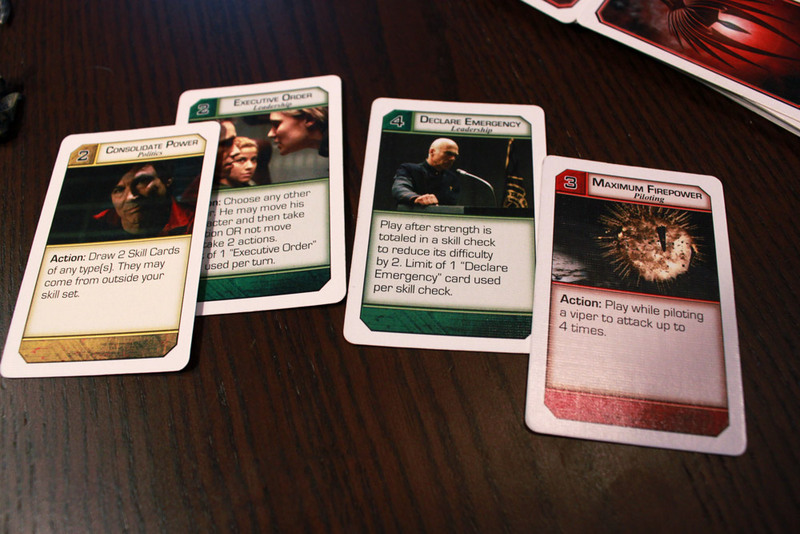 There are limited resources that will dwindle quickly throughout the game, not to mention Cylon player sabotage. Oh yes, Cylon players. 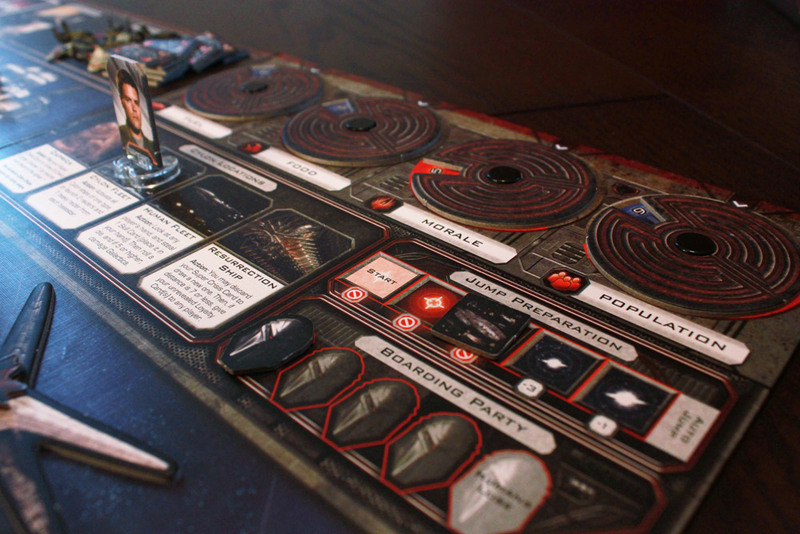 A number of players are Cylons, working against the fleet, and they win if the humans lose. Cylons when unrevealed are dangerous beasts, but they can reveal themselves at a key moment to do some serious damage to Galactica, and then work the rest of the game openly as a Cylon. Each player has a character with special abilities and a specific skillset. In addition, two offices – Admiral and President – offer special abilities, but these offices can change hands during the game. To win the game, human players must travel enough distance to reach Kobol, and then jump one more time. 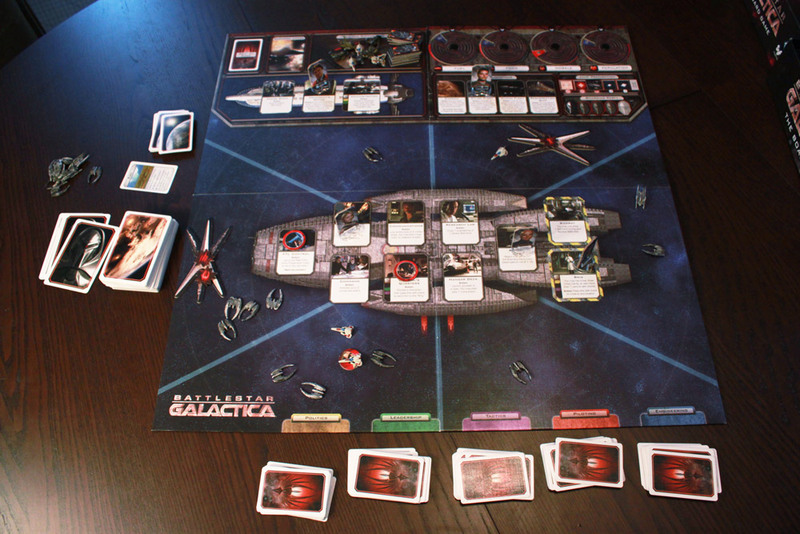 Cylons must destroy Galactica or eliminate at least one resource. Familiar faces, if you’ve seen the show. This game is one of the most exciting, epic, fun game of cooperation-with-a-traitor that I have ever played. It is brilliant. Does it ride on the theme and popularity of BSG? It certainly does. But it does not skimp on quality. It’s not a simple cash-in, that’s for sure. The first few times I played BSG, I had not seen the show. I am a sci-fi geek and had plans to watch it, but the game was still quite enjoyable. There’s so much to like about it. Now, admittedly, if you’re not into the theme, the game probably will not satisfy. It is heavily thematic and the mechanisms are tightly interwoven with the theme, so the gameplay alone probably wont cut it for you. Liking Sci-Fi and Traitor games should be enough, though. Not that the gameplay is bad at all. This is not a clunker that gets by because of its rich theme. The mechanisms are great, and even more so because of the thematic context. The game expertly captures the feeling of desperation and mistrust as you struggle to survive. Every decision that needs to be made is a tough one, and you feel like everyone else is a Cylon and you’re all alone in space. Cylons get special abilities for when they reveal themselves. The way Skill Challenges (which is pretty much the core of the gameplay experience) are handled is excellent. Since each character has a limited set of skills they draw from, the cards that are played can narrow down who might have tossed in a bad card. But the destiny deck always throws in a level of uncertainty – did a Cylon play that red card, or was it just fate conspiring against everyone? It gives the human players something to work with and the Cylon players something to distract with and it just ramps up the tension. I like that there are effective ways to deal with Cylon players once they are discovered. Or at least once you feel pretty strongly about your suspicions. Throwing someone in the brig will prevent them from doing any damage when they reveal themselves as a Cylon, but it also severely limits a human player, so you can’t just throw everyone into the brig and see who comes out as an evil robot. I also like that, once outed, Cylons still have something to do. It’s fun to be an infiltrating Cylon, but it can also be fun to just unleash your big guns. It’s even a legit strategy to just play up as a big-time Cylon right off the bat and hope that you can bludgeon the humans to death. Chief Tyrol, a revealed Cylon, eyes the dwindling Morale resource greedily. After finally seeing the show, the game got even better. Characters have a lot more context now; powers make sense. The game isn’t any easier, since the same characters who were Cylons in the show are not necessarily Cylons in the game, but so many of the mechanisms make brilliant sense after seeing the show. The sleeper phase, the crisis cards, even the destiny deck all fit within the greater scheme of things. Well done, Fantasy Flight. When watching the show for the first time, I whispered to my wife, “wow they did a great job capturing the feel of the board game in this show!” It was a joke, but it just goes to show how thematic the game is. I like the unique powers each character has; but I also love the positions of power that provide additional abilities can change throughout the game. The president has a special deck of cards that give her unique abilities; but it is possible to elect a new president, or even force the current president to give up their title. The Admiral has a couple nukes to launch at Basestars, but his position too can be changed. This all adds a level of tension and excitement as you really really hope you didn’t just elect a Cylon to be the president. Oh, and each character has a “flaw” of some sort – a negative ability they must deal with throughout the course of the game. The component quality of the game is, not surprisingly, excellent. The board is beautifully designed with ship and Cylon fleet locations clearly marked, and helpful dials to track resources as they dwindle. Cards are on a nice stock. The plastic miniatures are nicely detailed (note: they do not come painted. A friend of mine painted these tiny, tiny miniatures for me and I think he did a great job, but they come in a matte grey plastic out of the box) and fun to play with, and they accurately represent the ships from the show. I don’t know if you guys have noticed, but I love me some minis (note: the minis do not come painted in the box. My friend did these for me). If there is a con to this game – which honestly, it’s difficult to pick one out – it’s that there are a few outlying situations that can slow the game down. In one game, we had 4 of 6 people in the brig. Since people in the brig can only add 1 card to a skill check, and a skill check is required to get someone out of the brig, it became very difficult to accomplish anything. We just couldn’t get the numbers to get people out, regardless of whether we trusted them or not. But hey, some people really enjoy it when that happens, and it doesn’t stop the game. While the base game does support 3-6 players, you’ll get the best game with 5 players. 3 is just too few, and 4 and 6 have a weird “you are a sympathizer” card which comes out at the halfway point and publicly calls you out as a Cylon if the humans are doing too well. Mechanically it is a game balancer but in practice, it’s pretty lame for the player who gets dealt that one. Still, that card isn’t going to stop me from playing with 6. 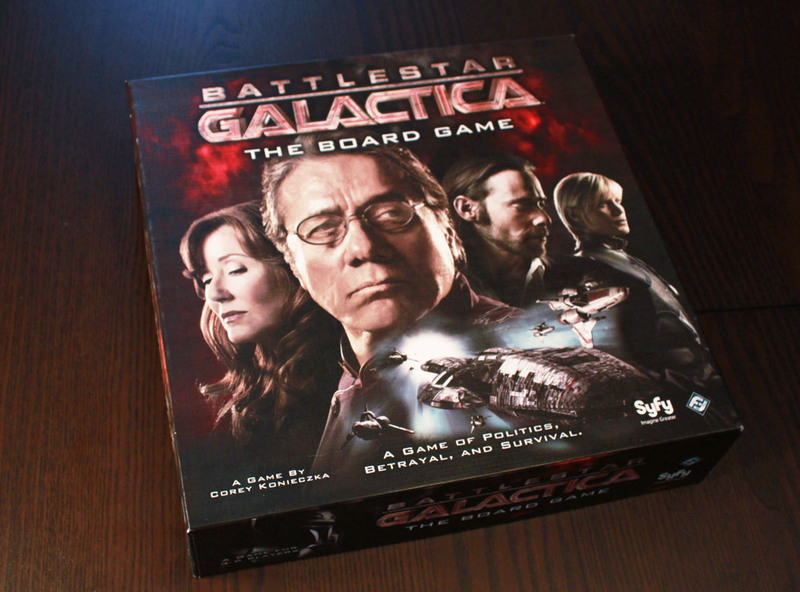 Battlestar Galactica is a great game, especially for fans of the show, or at least Sci-Fi fans. If you don’t like traitor games this one wont win you over, but it is a stellar entry into the genre. It does take several hours to play, which may be a turn off to some people, but the level of epicness is well worth the time spent. It’s also not going to win any euro-gamers over, but this is Ameritrash, or Thematic gaming, at its finest. This game really benefits from player screens, in my opinion. 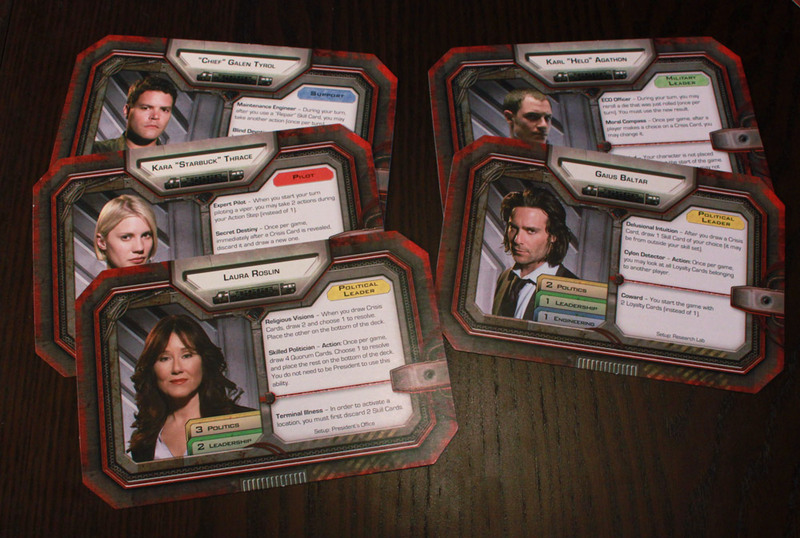 Unlike The Resistance, BSG’s traitor cards have special text on them that the Cylon players need to remember so that they can reveal themselves at an opportune time (which in my experience has been an important balancing factor to keep the human side from winning too easily). But because the loyalty cards for human players don’t have similar text, heaven help a newbie Cylon player who forgets what his “reveal” ability does. Needing to take a second glance at your loyalty card basically gives you away as a robot to the other players. You have to put up with some extra clunkiness as the price for BSG’s theme, which is unfortunate. I always make sure to tell everyone to take an extra long time to read their cards, regardless of whether not they have a Cylon card, to make it fair. And again during the sleeper phase, so Cylons can remind themselves of their abilities. The cards do feature a bold title that sums up what the “reveal” ability does, but I’ve never thought about using player screens. Definitely something to consider. I liked my one play of BSG, but I don’t think I’d play it often. It has a better ROI than, say, Android, but I like games with a higher enjoyment/game time ratio. But epic it certainly is. Great review! Now I’m really amped up to try this game in full. I was taught how to play once, but only got to play like a turn and a half before someone realized they had to go home. Sadly the game ended there because we didn’t have enough players anymore.